The brief was to individually seat 8 people in comfortable, contemporary surroundings, allowing them to watch a variety of sporting events and Blu-ray movies, in addition the client wanted to be able to access his extensive DVD collection through the cinema system. His young children and their friends should be able to use the cinema with ease and safety whilst also protecting the equipment and media from damage or misuse. Following a detailed site survey it became clear that the room proposed for the cinema would be insufficient to deliver the level of cinematic experience that the client desired. We recommended making use of a double garage that formed part of a large stable block adjacent to the main property, whilst a far more suitable location, this in turn presented some additional challenges to be met by the design brief. Notably the security of such an extensive cinema system in a building separate to the main house was a major concern. The client was also keen to ensure that no sound escaped from the cinema that would disturb his neighbours or livestock. Having received our proposal, costing and a detailed explanation of the proposed system the client was delighted to appoint Finite Solutions insisting that we handle all elements including the building, interior design and first-fix wiring as well as the installation of the cinema system itself. Initially concerned that the screen size might be too large we produced detailed 3D renderings allowing us to show the client a virtual first-person view of the finished installation. The initial design revealed that the room was slightly too short to provide optimised seating positions for those on the rear tier of seats, the client agreed that removing the existing rear wall and extending the building would vastly improve the performance and feel of the room, it also provided an opportunity to create a central aisle which formed a particularly pleasing feature. Once the basic room layout had been defined Finite Solutions appointed an interior designer to specify and produce detailed visuals of the final colour schemes and soft furnishings. These plans and visuals assured the client of our attention to detail in all aspects of the design not only the general layout and interior design but also the storage, cabling and access to the main equipment rack. 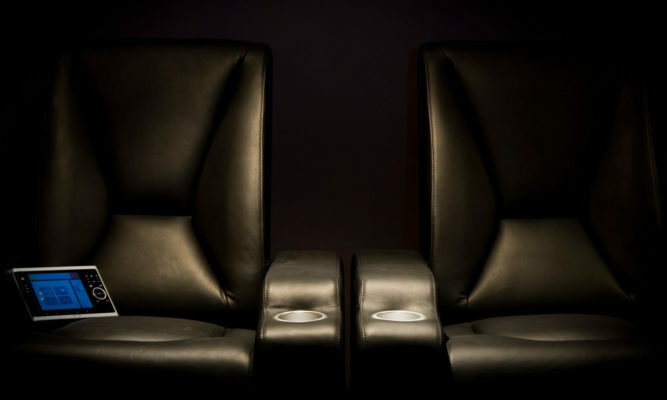 The speakers selected to provide reference level performance with high sensitivity and good dispersion were the Triad Gold series in-wall speakers to provide the ‘LCR’ configuration, these speakers allowed the ‘sweet spot’ to be enlarged to form a ‘sweet zone’ which encompassed the two inner rows of seating across the aisle. Triad Gold in-ceiling speakers were used to provide the side and rear channels and finally two Artcoustic Spitfire subwoofers were used to provide rich, immersive low frequency performance. The LCR and sub units were all mounted into a bespoke baffle wall covered by the Screen Research 8ft acoustically transparent projection screen. As Finite Solutions retained overall control of the entire project we were able to brief both the building contractor and interior designer to enable the acoustic properties of the room to be carefully managed. The room was lined with double thickness acoustically absorbent plaster board and all windows and unused doors were blocked up and sealed to eliminate any vibrations, silicone isolators were employed to prevent sound from the cinema being transferred through the fabric of the building to the outside. not only to complement the design scheme but also to reduce unwanted sound reflection within the room and transmission to the outer structure. The straight lines of the room were broken up using feature panels which were backlit to enhance their appearance and provide discrete indirect lighting ideally suited for intermission illumination. These panels improved the acoustic performance of the room by absorbing any unwanted frequencies, the outer plasterboard walls were lined with fabric not only to complement the design scheme but also to reduce unwanted sound reflection within the room and transmission to the outer structure. 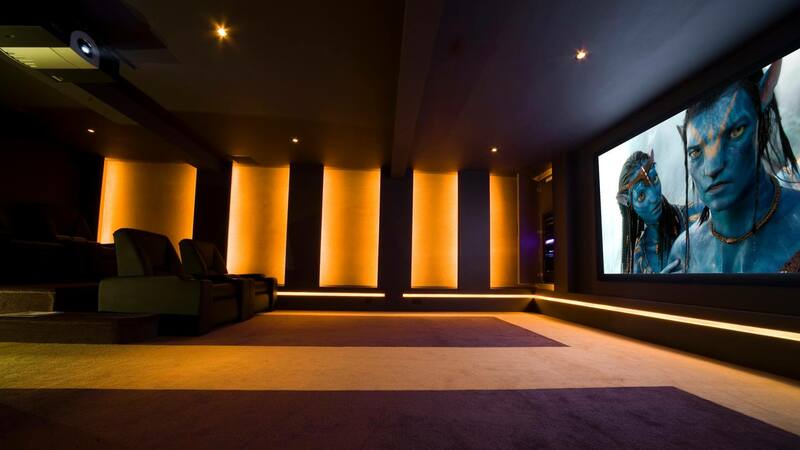 The client’s entire DVD collection was made available to him with the addition of a Kaleidescape mini system with 1.5TB of storage, eliminating the need to return to the main house each time a movie was required. A Denon DBP2010 Blu-ray player was added for new HD content and a Sky HD box added primarily to provide high definition sports coverage. The existing house CCTV system was extended to include coverage of the external area around the cinema and was also made available to view on the cinema screen. As with any cinema installation appropriate lighting was essential to ensuring that every visit to the room was special and that the cinema was used in the optimum environment. A Rako system was used to provide four pre-programmed scenes of lighting, two dimmable and two switched circuits, controlled from both an in-wall panel and also via the Philips Pronto Controller. The client had found the experience controlling our showhouse hidden cinema via our Philips Pronto 9600 to be incredibly easy and intuitive, however for the benefit of making the system as clear and simple as possible for his children and guests to use he opted for the 9800 model, with a larger 6.4” screen. A Middle Atlantic rack system was used to house all the equipment in a discreet cupboard located to the side of the projection screen, the entire rack was cooled using an extremely quiet extraction system to draw fresh air in an extract hot air from the top of the rack to an external vent. 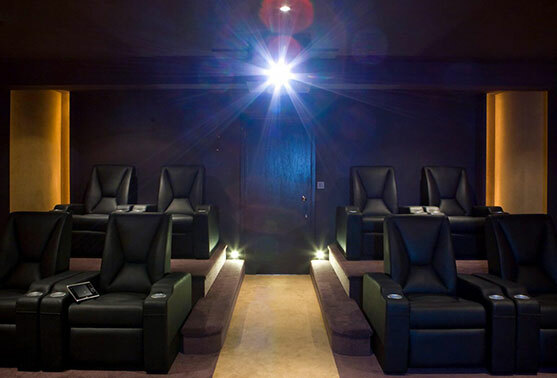 The entire project including the necessary building work, interior design and installation took less than a month, the client was delighted; not only with the attentiveness of the design and project management team but also the speed of the installation as a whole, receiving a further commission to design and install a games room was testament to their satisfaction with our work on their cinema. "Not knowing which solutions and providers to choose was a major problem in the planning phase of our project but I’m happy we choose Finite as they were only the company who really made the extra effort to listen to what we wanted and specify a solution accordingly. Throughout the project and now at completion we have been impressed with the diligence and desire to get everything just right."